French sprinter Mathilde Gros is hoping to make a strong start to 2017 as she makes her elite World Cup debut in Cali and Los Angeles. The former basketball player stepped on to the world stage in 2016 winning European titles in the sprint and 500m time trial in blistering times at the European Junior Track Championships in Montichiari, Italy. While in her own words a disappointing Junior World Championships followed with fourth in the 500m time trial and fifth in the sprint. The 17-year-old bounced back to claim the elite French titles in 500 metre time trial and keirin. With success as a first year junior, Gros will face her biggest challenge to date in elite competition against some of the fastest sprinters in the world. Looking ahead to the rest of 2017 Gros has is firmly focused on defending her European titles and adding a medal in the keirin as well as pulling on a rainbow jersey in the sprint at the 2017 UCI Junior Track World Championships in China. Two years ago you were playing basketball how did the switch to cycling happen? I was in the basketball Pole of Aix en Provence two years ago. The French BMX Team was also there and was training with us in the same room. New prototypes had arrived (the WattBikes) and to test them my basketball coach chose me in a random way and I did sprint efforts. The power results were very amazing for my age and almost incredible, and the coach of the BMX France came to me and told me I was made for the bike, because I had incredible power in the legs. Four months later, I was called by Justin Grace who was the coach of France Pôle at that time and I went up to Paris to try the track. Your first major event at the international level was the Under 19 European Championships last year what were your goals? I wanted to do a top five in sprint, a top six in keirin and a top time in the 500m. Qualified in 10.999 and went on to win the sprint at the European Championships, at the time the second fastest time recorded by a junior and quickest outside Moscow you must have been pleased with the time? What did it mean to claim the European title as a first year under 19? I was so surprised, I was not expecting it at all! For me I thought it impossible because the best time achieved in junior on a huge track with bends 8 or 9 meters high was 10.85. For me, going under the 11.00 on a normal track was impossible. I thought becoming European champion in my first year junior was impossible for me. Winning the race gave me confidence in my potential and it made me realize that I could be tactical and technical. But it is only a step because I understood that we only remember the champions of Europe or the World in elite category and not junior. Backed up the following day to claim gold in the 500m time trial in another very quick time of 34.836 how did it feel standing on the podium with a second European title? After winning this second title I could not believe it. I did not believe it. Being on the top step, hearing my national anthem and seeing my family crying just in front of me, brought me so many emotions and immense joy. I was so proud. These were unforgettable moments that will remain forever in my memory. And mostly, it gives me more desire because I would like to have more moments like these. Two gold medals and two very quick times were you able to take confidence from those results heading in to the Junior Track World Championships? Once the European championships finished, two days later, I had the Junior World Championships, it was necessary to refocus and to forget the victories because I had to cope with new opponents who were even stronger at the World Championships. During the World Championships I no longer thought of the European Championships. Fourth in the 500m time trial at Junior Worlds in 34.850secs just missing a medal you said at the time you were disappointed both in your time and the result was it difficult to refocus for the sprint and keirin? Yes it was a great disappointment for me. I wanted to win but I succeeded in refocusing and after a long discussion with my coach in the evening. I was determined again to ride quickly the next day. Fastest qualifier in the sprint in 10.967, the only rider under 11 seconds beating the world record holder and a setting a new personal best. Were you happy with the time? You finished fifth was it disappointing not to have challenged for the medals? With this time in Aigle I did not believe it. I knew that I was able to ride under the 11 seconds but I did not think I was able to ride again in Aigle on a 200 meters track twice. These kinds of tracks are not to my advantage. It was for my coach and for me a big and beautiful surprise again. You then claimed gold in the keirin and 500m time trial at the Elite French Championships what does it mean to you to have won two elite French titles as a junior? It is a great victory for me but I know that the international level is much higher than the French level. For me it was the minimum to get a win. It allows me to practice for the big races such as Track World Cups or the European and World Championships. Ahead of the Junior European and World Championships you raced Fenioux Piste International and Trofeu CAR Anadia Portugal in May and June, two elite races against some strong competition. As a first year junior do you think the experience gained there helped you at the European and World Championships? The competition in Anadia gave me a very good experience and I think it helped me for my championships. I rode against Spanish competitors ho were in the last Olympic Games. It was a great privilege for me because I learned a lot. The objective will be to ride with the elites as often as possible (always choosing the competitions) to be able to practice and improve my weaknesses. Having only been racing for two years do you feel you are getting stronger and smarter tactically with every race you do? Each race is a new step forward for me. I have been on the bike for only two years but I have only really practiced it for a year and a half. Every race is very important to me. I always learn from my mistakes. Riding on different tracks bring me self-confidence, it allows me to learn how to do my warm-ups. 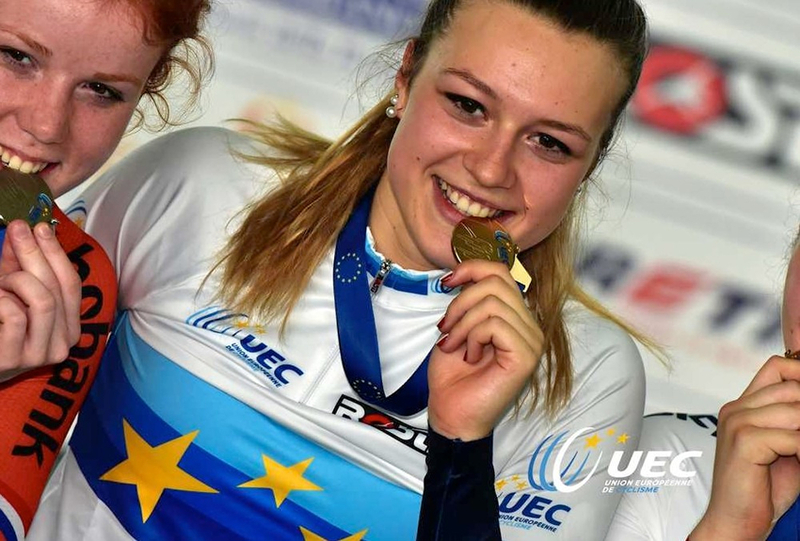 When you first started cycling did you think two years on you would be a dual junior European Champion? When I started track cycling I thought I would have to wait a long time before winning an important competition. I never thought that my progression would be so big in only two years and I did not think at all to be double European champion in my first year junior. You have been selected in the French team for the Cali and Los Angeles World Cups. To go to an elite World Cup as a junior what does it mean to you, what are you looking forward to and what do you think the biggest challenge will be? It's for me a great event. I am very happy to participate at the World Cup in Cali and Los Angeles. It's my first competition in elite. So it's just take experience during these weeks. I really do expect good results during these competitions even though I am still a junior. 2016 was a successful year what are your goals for 2017? A big focus on the Junior Track World Championships and winning a world title? After competing in the elite World Cups in February in Cali and Los Angeles my most important goals would be to win the junior sprint world title and finish top three in other disciplines. And of course, I'd like to keep my European titles at the next European Junior Championships and succeed in winning a medal in keirin. These are quite high objectives but I hope to do my best to win in 2017.